Players in the game are elected by other players to become governor of Cities, Emperors of Planets and Star Lords of Solar Systems. These leaders earn a tax revenue from the city populations within the area they control. They are also expected to defend their territories, including the players based within them, and vote on events that pursue that areas best interests. When a location has a certain amount of industry happening within it, usually from resource mining, it becomes a City and an election for its governor happens within 100 turns (about a day). This acts very similar to a random event. Only players who have their Corporate Headquarters in that location can be elected to be its governor. Only players who have industry of some kind occurring in that location can cast a vote and the more industry a player has, the more weight his vote carries. Only paid accounts can cast votes in any event unless the event states otherwise. The winner of the election earns the title and receives tax income every turn which amounts to the population of the city in credits every week. The elected official must keep his Corp HQ at that location or lose his title immediately. When a certain number of cities are formed on a planet, an election for a planetary emperor is created. Similar to a city election, only players who have their Corporate headquarters based inside that planet area can be elected. Anyone with industry occurring on that planet can cast a vote with their total industry in that area weighing in. Elections for Star Lords are nearly identical to planets except the scale is anyone in the appropriate star system. Elections for government positions are held every week on the same day which that city, planet, or solar system became politically active. Players can be voted out as fast as they were voted in every week. If for whatever reason an elected player loses his position (elected for higher position or quit game for example) the area simply runs without a governor until the next election. Corporations can have titles which represent their role as a governor or their ranking in military power or specific industry in an area. Every day titles are re-calculated for every city, planet, and star system with the top 3 corporations of each category acquiring a title. The location of a corporation headquarters determines the location named in the title. A corporation can have up to three titles; one for Government, one for Military and one for Industry. If you are a governor of a city, planet, or star system you will receive the title of "Governor of", "Emperor of" or "Star Lord of" that particular location. 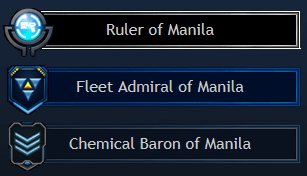 Military titles are given to the top 3 ranked players in military power for each city, planet and star system. Industry titles are the most common as they are given to the top 3 ranked players for each product category and for each city, planet and star system. Your titles are displayed to anyone who searches your corporation on the Company List section of the Corporate tab. We also plan to incorporate the title insignias into the forum and other social areas.